The best painting jobs require a clean surface to work on, which is why J Linder Painting offers the best in pressure washing in Olympia and the surrounding areas. The damp climate in the Northwest encourages mold and mildew to grow on everything, making surfaces slick and dangerous. 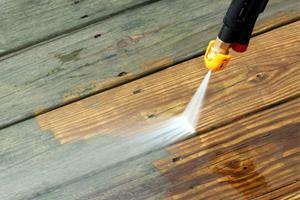 Pressure washing removes this threat and keeps your building materials safe from the damage mold and mildew can cause. Pressure washing can be complicated, as you may cause structural damage if you are not experienced in how to go about the process. From knowing what pressure to use on which types of surfaces, to what temperature and cleaning agents are safe, we understand quality pressure washing. Renting a pressure washer, at times, is even more expensive than hiring a trained professional. So why risk it? Our staff has years of pressure washing experience, which means we can guarantee you will be satisfied with the work we do. Don’t let just anyone take the responsibility of pressure washing your home. Trust the work to the experts and you won’t be disappointed. Pressure washing can prepare any space for a fresh coat of primer and paint, ensuring that any paint job we do for you will last. Our staff is highly trained in the art of power washing, giving us an edge and allowing us to offer a complete and full residential and commercial painting service for all of our valued Olympia customers. We value your satisfaction above all else, and we strive to deliver premier customer service on every job that we commit to. If you need a pressure washing for the exterior of your Olympia home or business, deck, or patio, fencing, or other surface, give us a call. We deliver quality work, guaranteed. Contact us today for pressure washing in Olympia and the surrounding cities.